Tracking numbers are individual phone numbers that are used to for specific marketing channels and/or campaigns. Each channel gets a different phone number so that business owners can see which campaigns are the most successful. These incredibly useful tools give you valuable insight into the success of any marketing efforts. Inconsistent information can seriously mess up your search engine citation profile. Tying a consistent name, address, and phone number (NAP) to your business verifies that it is legitimate. That's why consistent citations are key to making sure your business ranks high in local search. 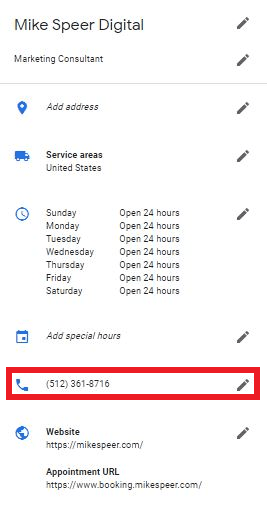 In the past, adding a call tracking number to your Google My Business (GMB) listing would have been an SEO death sentence, but now there's a way to do it without throwing a funeral for your search ranking. So, why would you want to track which calls come from Google searchers? Simple. To tell just how successful your local search marketing truly is. While Google does track calls from click-to-call in their Insights Report, this data is only available for calls that come from mobile devices. That means that there is no information on how many people found your GMB listing on one device (like a desktop computer) then physically dials the number into their phone. 1. Go to your Google My Business Dashboard, and click the "Info" tab. 2. Here, you will see all the contact information you've already entered, including your business's phone number. Click the edit button next to this number. 3. You will see an option to "Add Phone Number." Add your GMB call tracking number to the "primary phone" field. This is the only number that will appear on your GMB listing, so you'll now be able to track how many of your calls come directly from Google. Pretty cool, right? 4. Don't forget to add your main business number (the one that appears on your website, official documents, etc.) under "additional phone." This step is crucial to making sure that Google is able to match your NAP information across the web. If you forget to add this information, your SEO score will plummet. You can also add some other frequently used phone numbers into your GMB listing as a quick fix to any citation consistency problems. Keep in mind, however, that you may only list two additional numbers, so use those slots wisely! Call tracking is an important tool for evaluating your local search success. Without it, you're not getting all the information you need to find out how successful your listing is at converting searchers. Speaking of which, remember to give the guys and gals over at Michaels Wilder a call for help with revamping your GMB listing. Our experts have proven experience in optimizing your business for local search and giving you a step up on the competition. Contact us for more info!